Orlando, Florida – Bohemia Interactive Simulations (BISim), a global developer of military training and simulation software, is revolutionizing flight training by leveraging emerging virtual reality technologies and BISim’s Virtual Battlespace (VBS) to provide a high-fidelity virtual environment for training and mission rehearsal. Working under contract for the Naval Air Warfare Center Training Systems Division (NAWCTSD), BISim developed a prototype, VR technology-based F/A-18 Super Hornet training system designed to demonstrate the art of the possible. Where today’s high-end simulators rely on multi-million dollar display environments and physical cockpits, emerging VR technologies that cost an order of magnitude less are featured. The F/A-18 avionics, weapon systems and flight model are faithfully simulated by Flex-Air from SA Simulations. The technology is standards-based and integrates with the Next Generation Threat System (NGTS) developed by NAVAIR that models both threat and friendly aircraft, ground and surface platforms, and their corresponding weapons and subsystems. 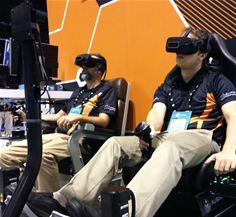 The VR technology, which runs on a COTS high-performance PC, incorporates a flight stick and throttle which serves as the sole physical interface to the system. The program demonstrates that a wide variety of training requirements can be met with the technology as it is today. If offered as part of a blended learning solution, VR solutions can help to fill gaps between classroom-based instruction and full mission simulation and live training.